Had my six week follow-up appointment today and things look really good. Incision is healed well, swelling is down, everything feels well-attached and proper. The doc moved my foot all over and now it aches a bit, but otherwise I have permission to start putting my toe down and doing a teensy bit of weight-bearing. I'm allowed to put my booted foot on the floor for balance, and can touch it down if I'm using the walker, but no real pressure yet. I also have removed one of the wedges from the boot, so my foot is a tiny bit more flexed and I'm starting to stretch out the tendon just a bit. I can do range-of-motion exercises now, too. Those are pretty self-limiting --- move my foot up and down, side-to-side, around in circles and if it pinches or hurts, back off. That's a relief, actually; lately, the urge to twitch and move my foot have been almost irresistible. I've been trying so hard to do exactly what the surgeon ordered (do not move foot! do not flex ankle! elevate! No weight bearing!) and it was starting to be an all-consuming obsession. I know I move my foot at night when I sleep, but now I can do it purposefully and not worry about it. Weird when that sort of thing makes you happy, isn't it? And I have the OK to switch over to ibuprofen (Advil) instead of Tylenol. 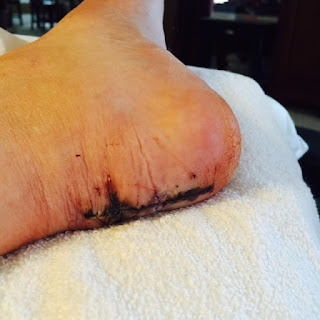 Initially, they don't want you taking an anti-inflammatory while the tendon is starting to re-attach; it can cause issues with healing, I guess, since there is so little blood flow to the tendon and the heel. But Tylenol doesn't do squat for me except give me a sour stomach. It doesn't even kick a headache. So if it was taking the edge off the ache in my heel, it didn't seem to be doing it very well. I'm allowed to go back to ibuprofen regularly for a week to see if it helps. I'm hoping that it does, and that it lets me sleep better. I've just been sort of twitchy and restless at night, and not sleeping very well. Mark thinks it's because it does hurt more than I'm recognizing and that sort of achy-can't-get-comfortable feeling is how I register pain. Go figure. I wouldn't say that things hurt, but if I think about it, I'm acutely aware of my heel and that it aches and twinges. Getting rid of that distraction will hopefully let me sleep better. Here's hoping! Four weeks until my next followup, when I should be able to remove the rest of the wedges in the boot and start weight bearing a bit more. The estimate is that it will be 6 weeks until I'm walking in the boot vs hobbling, and then another month or more before I'm bootless. Definitely a conservative plan, but we'll see how it progresses once I start PT and strength exercises after the next review. I'm figuring I should be walking in about five months or so -- which matches up with the estimates I saw online, and what my surgeon discussed with me. And then I get to do the OTHER foot! The criteria is that I have to be able to hop and stand on my toes with the left foot before I can have surgery on the other one. I'm having a hard time with that sometimes now, with achilles tendonosis in my right heel causing problem sometimes. There are days when I can't raise myself up on my toes, which makes everything harder. Mark is installing a grab bar on the garage so that I have an easier time getting down the two steps from the porch to the garage door. That will help now that I can maneuver myself out to the car and drive (his car only -- mine is a stick shift!). It's a hassle, and I'm very slow, but it's good to be able to do it myself. Can I come into the Out Now? Lazy weekend, spent most of it watching TV and doing crossword puzzles -- I can't seem to sleep in, for the last few weeks I've had a hard time sleeping. It's not so much a problem with falling asleep, but I think I'm just uncomfortable enough that when I get through a sleep cycle (about 90-100 minutes for me), I actually wake up enough to be, well, awake. Instead of just rolling over and falling back to sleep immediately, I have to wake up enough to roll over without bashing or bending my foot. Or I try it without fully waking up and something zaps me in my heel or ankle and I am Awake Right Now. It's annoying. It's particularly annoying because once I wake up enough to do that, I wake up enough to have to pee. Seriously. Never in my life have I been able to roll back over and go back to sleep if I even have the barest hint of a thought that I need to go to the bathroom. So, foot twinges, I wake up to roll over and then...well, crud. Sit up, find and put on the boot, maneuver the scooter to the bathroom and voila! I am up and can't quite fall back to sleep. So I lie there for a half hour or more, staring at the wall and trying to get comfortable. I mean, I love sleeping without the boot -- SO much easier than trying to flop the giant plastic and foam cast around -- but I am just not sleeping well. Benadryl at night seems to help, a little. Well, the vicodin does, too, but I don't want to take that unless things hurt and they don't really. They are just...uncomfortable. I toss and turn a bit and end up sleeping in the same position, which makes me stiff and sore in the morning. But my foot is feeling better --after soaking yesterday and scrubbing all the dry skin of my foot and leg, I was sitting in the chair and my foot just felt like it was tight, like the skin was too tight. I really think that it was just so dry and "new" that it hurt to move. Which is why it's surprising that it took a few hours to think "oh! Lotion!" and slather the stuff on like it was going out of style. Seemed to help a bit, although my toes are swollen enough that touching them is uncomfortable. Wiggling them a lot helped, too. Spent more time today with my foot unwrapped and airing out. 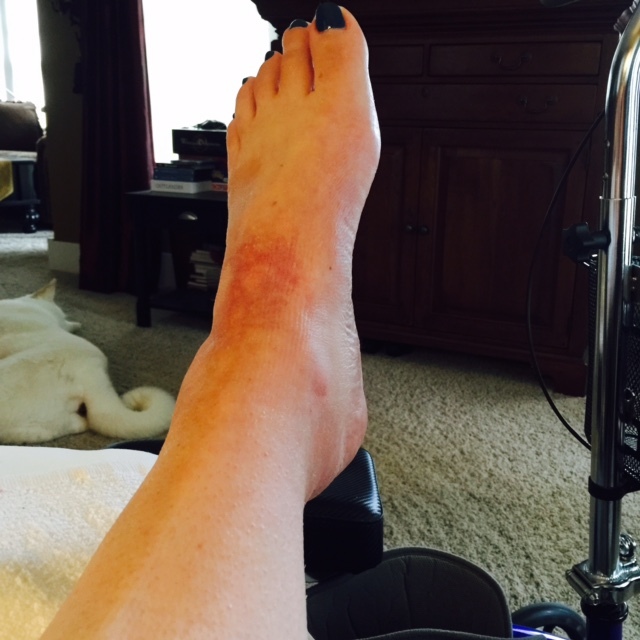 Mark is a bit worried that I might have a pressure sore on the top of my foot, but it seems to look better today. Not being able to move my foot much is beginning to be a problem--I want to roll my foot around, and I'd really like to confirm that the flaccid calf muscle will still work. Even a twitch right now makes my heel hurt, so I am trying to ignore the urge to move my foot around when it's not in the boot. I'm really looking forward to the surgeon's ok to start to try to move it a bit. (Although I'm also dreading it -- I don't know if it will hurt or not, and I'm a bit terrified of having pain like I did when I fell). We watched the animated movie "Home" --quite cute, and the main character (and alien named Oh) has a scene where he's locked in a freezer, and asked, "Can I come into the Out now?" That's how I feel every day...I'm getting heartily sick of the view from my recliner. I want to be OUT of the house, even to just drive to the gas station. I don't care! OUT! Yup, cabin fever has set in. Argh! Not a sit-on-the-shower-chair affair with my foot in the giant baggie, trying to wash while sitting and holding the shower sprayer, not a washcloth-and-towel sort-of wash, but a full-on, soak in the bathtub until I was pruney BATH! I had to drain and refill the tub twice, but I am scrubbed and exfoliated (which was a wee bit gross, what with my foot in the bandages and boot for the last month) and clean! We have a bit soaker tub in our bathroom, so I had a pretty easy time getting into the bathtub. Mark supervised. Getting out was a bit harder, but I can still manage it if I'm very careful. I'm just so paranoid of doing anything without the boot on, that it's hard to maneuver without the boot and not bash or twist or press on my foot. My poor leg is all skinny and atrophied (no movement at all for a month, I hope it remembers what to do in two weeks when I can start moving my ankle!) but it is at least hairless now. 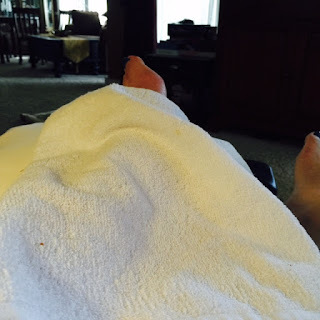 Mark says the incision looks good, and I'm sitting in the chair letting my foot air out and dry. But I get queasy looking at the incision, so he has helpfully draped it with a washcloth so I don't have to see it. It's pretty funny, actually. I am just a wuss. It doesn't actually look too bad (and for some reason, looking at the pictures doesn't make me want to hurl, just the live foot does that. I don't see the surgeon again for another week and half (at full six weeks after surgery) and hopefully the next step will be to start doing some weight-bearing and starting to stretch the tendon back so I can stand flat-footed. Right now, my foot is pointed at a "neutral angle" and I am not supposed to pull on the heel at all. That process will take 4-6 weeks as well. He's being very conservative, but I'd rather be slow and sure than risk damaging something or having a ton of pain.